QUICK COURSE DESCRIPTION: How to create fresh, interesting characters in about in about 15 minutes, how to write them so they live on the page, and how develop them over time for your story OR series. You can create and write characters who live and breathe on the page; who capture the attention of readers, agents and editors; who drive your story from a compelling start to a captivating ending. It's not a trick, it's not some gift of the Fiction Fairy bestowed on only a few. You have everything you need within you to start creating brilliant characters today. If you jumpstart with the Shadow Room exercise, you can know enough about your first new, compelling character to start writing about him...in about 15 minutes. My system is simple and step-by-step. I break character development down into techniques you can start following immediately. I'll show you what I do, and then take you through doing it yourself. And I keep it short—you shouldn't have to wade through tons of words to find the few kernels of useful knowledge that you can start applying to your own work. So that you can start using it right away, this book is divided into three sections. 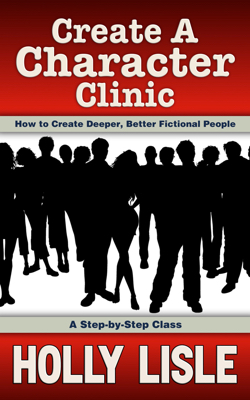 Section One is Ask Them Anything: I explainand then demonstrate—each of seven critical areas of character development, along with giving you printable charts offering questions that will give you a well-rounded framework for your characters. Answer as few or as many questions as you need to get a feel for the people you'll be writing about, and ask (and answer) more as you work through your story and need new twists and turns. Section Two is Bring Them To Life: A tutorial on how to put all the information you've developed into creating people who live on the page. Section Three is The Sins of Characterization (And How to Commit Them Well): Believe it or not, almost everything you can ever do wrong in putting characters on the page, you can also do right. Here I show you when a writing sin can be a virtue, and vice-versa. All three sections include demonstrations of both unpublishable and publishable approaches to techniques and problems, and exercises that allow you to put what you've learned into practice. I want to make this as close as I can to me reading over your shoulder, looking at what you've done, and saying, "Okay. Here's what you can try next to get that character moving." Today, right now, you can turn your characters into people YOU want to read about—because if YOU aren't desperate to know what happens to them next, your readers won't be, either.